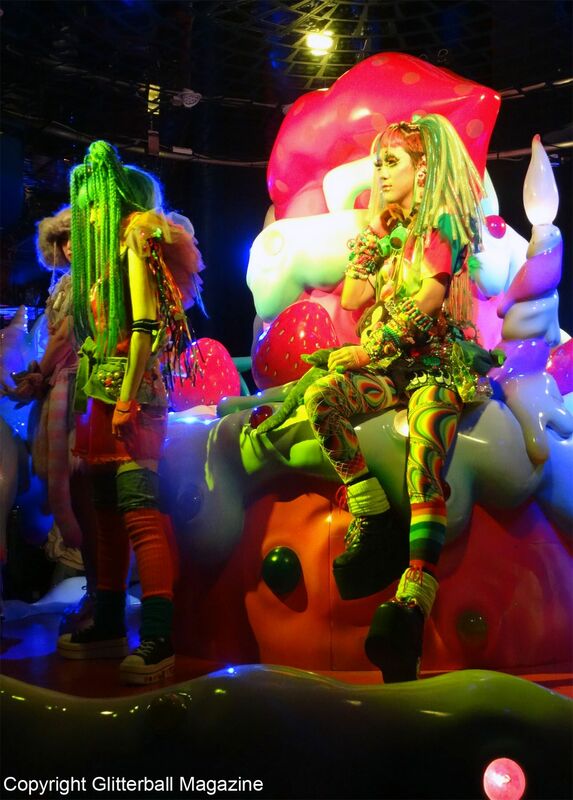 Experience real kawaii food in the heart of Harajuku at the iconic Kawaii Monster Café in Tokyo. 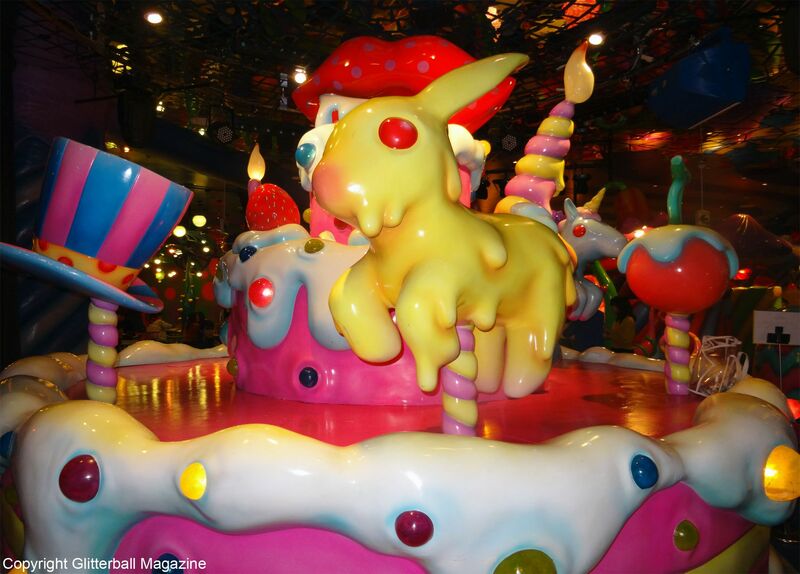 Where else would you find a gigantic merry-go-round, oversized macarons on the wall and huge plastic animal heads drinking from baby bottles? 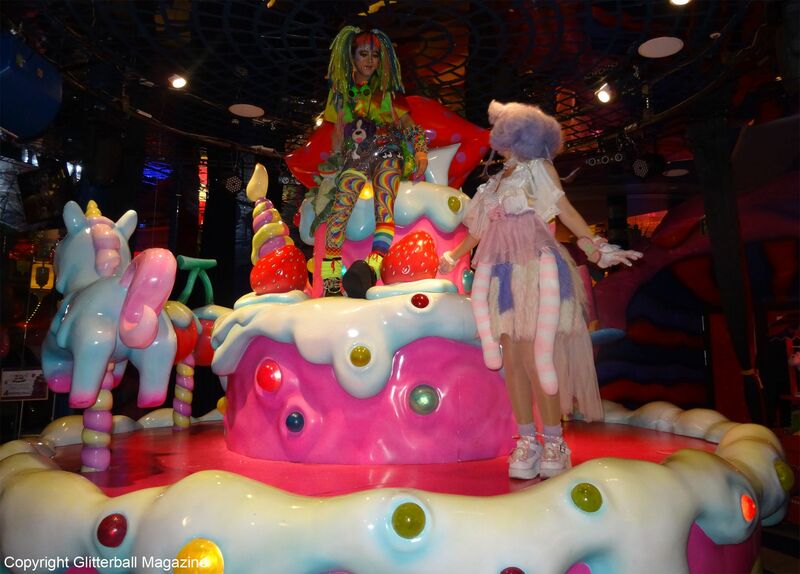 If you’re a fan of Harajuku fashion, this is the place to be for kawaii entertainment and food. After a near nervous breakdown trying to locate the café in Harajuku, I finally made it. If you’re thinking about visiting, let me save you some time. 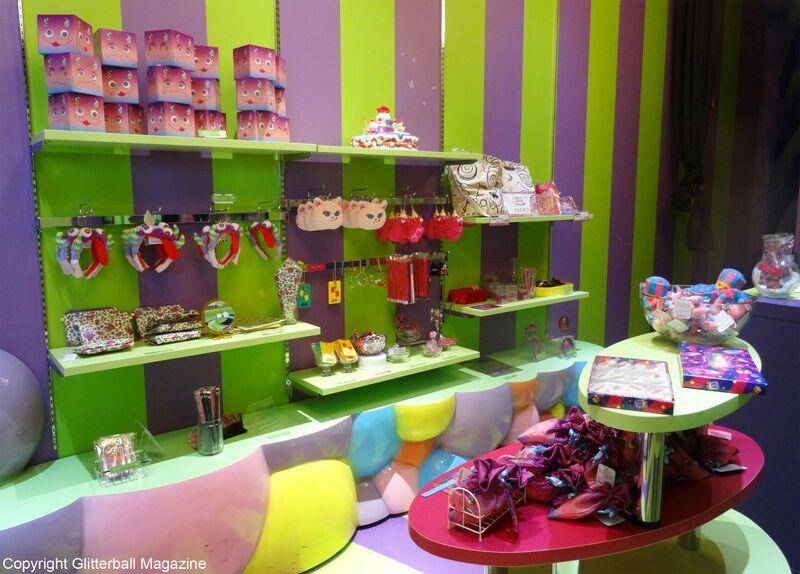 It’s on the fourth floor of the YM building opposite Laforet Harajuku, close to the Line Friends store. 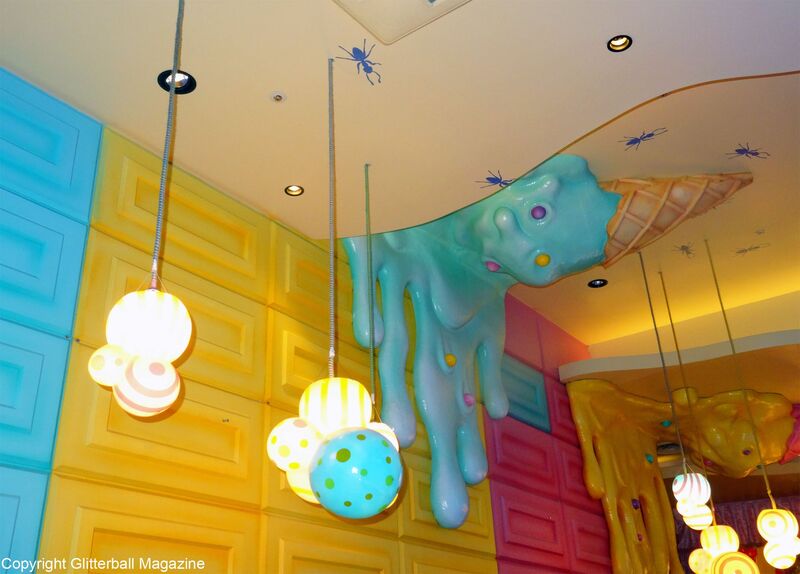 Before entering, you must choose a room to sit in, the Mushroom Disco, Mel-Tea Room, Bar Experiment or the Milk Stand. I picked the Mushroom Disco and nervously held my breath in anticipation. 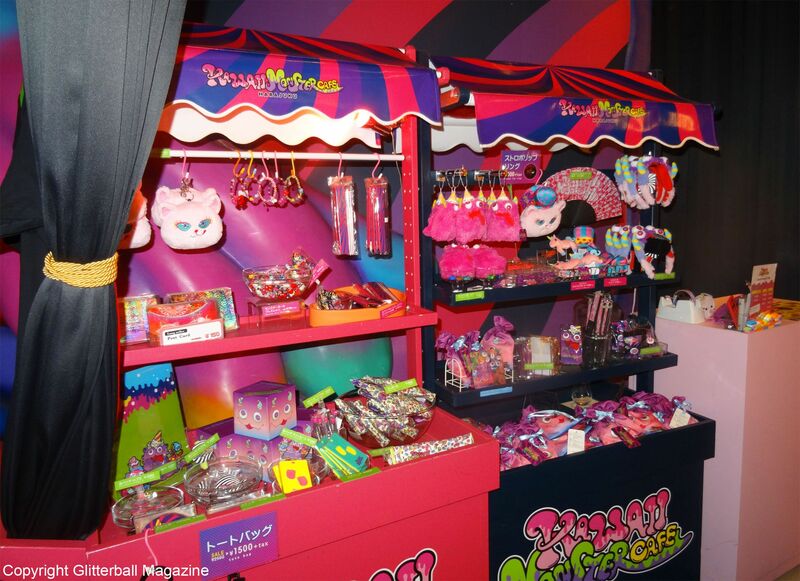 I’m sure I stopped breathing for a few seconds when a girl dressed in kawaii fashion opened the lavishly decorated double doors. 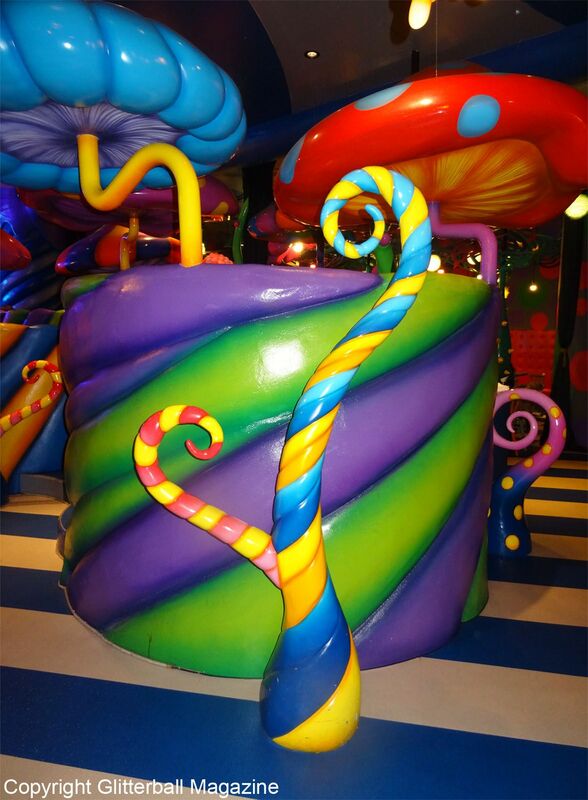 I felt like Charlie Bucket entering Willy Wonka’s Chocolate Factory. 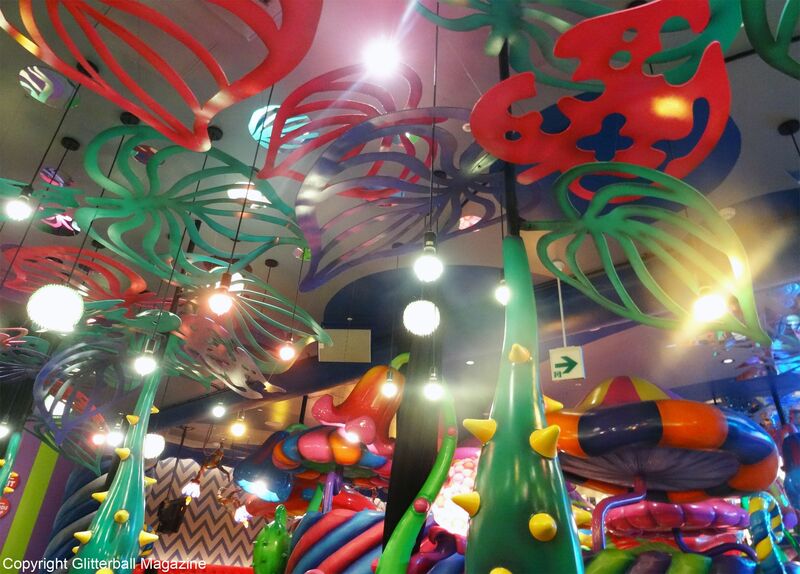 So much neon and eccentric interior design. 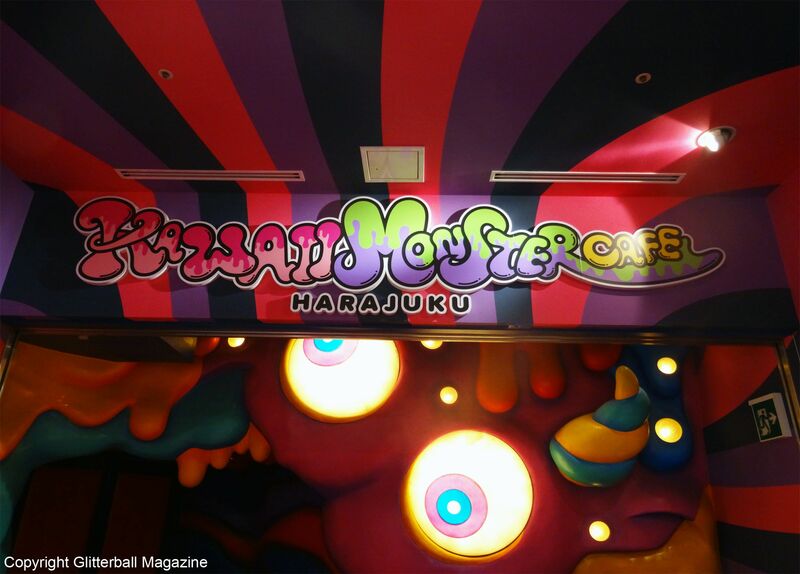 The Kawaii Monster Café is the ultimate kawaii paradise. 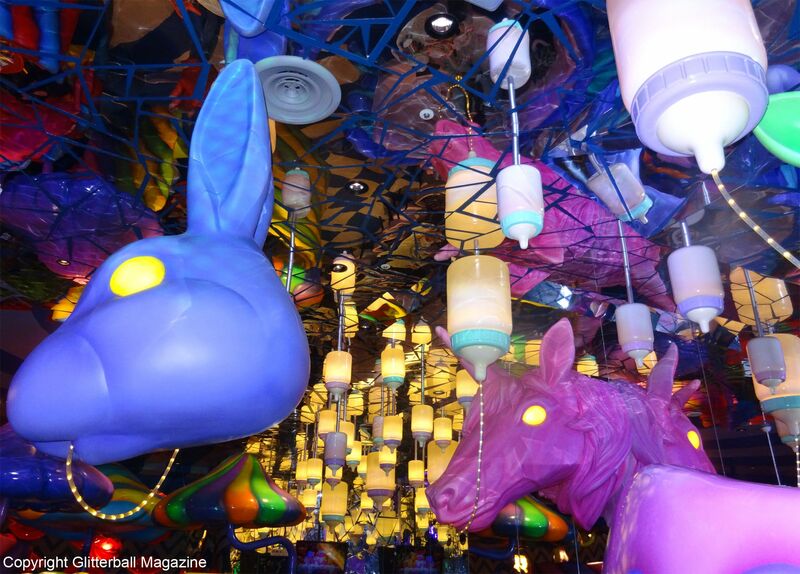 Opened in August 2015 and designed by legendary Japanese artist Sebastian Masuda (who’s behind J-pop star Kyary Pamyu Pamyu’s iconic PONPONPON music video), there’s lots to discover. I spent so much time exploring each area that I almost forgot to order something to eat. 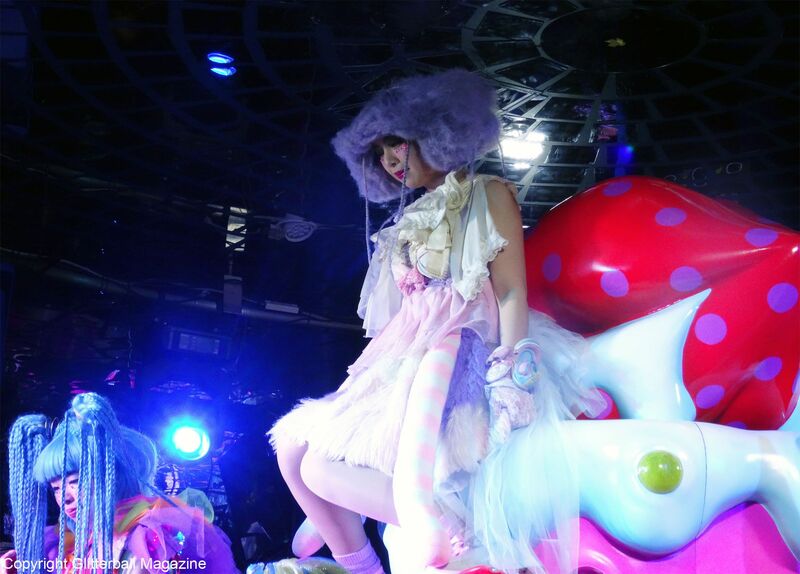 The Mushroom Disco area is the perfect choice for Alice in Wonderland fans. 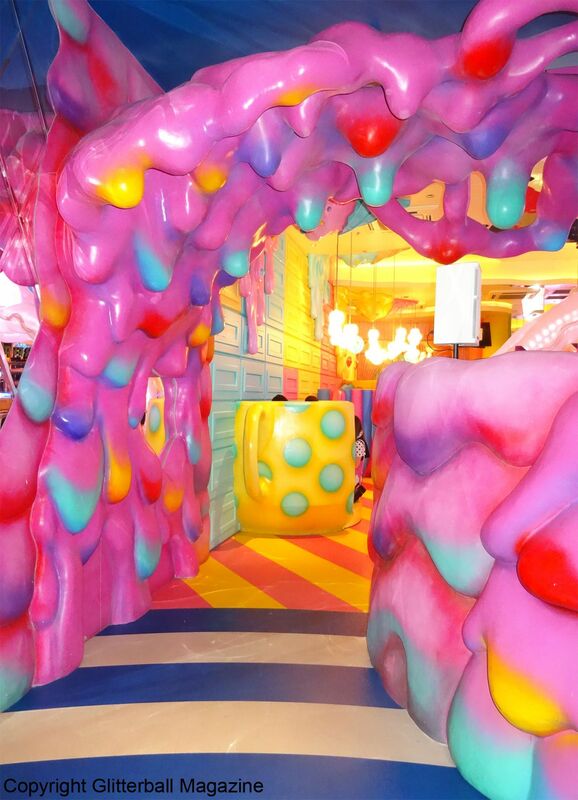 It’s packed with bright coloured towering mushrooms, oversized leaves and striped booths. 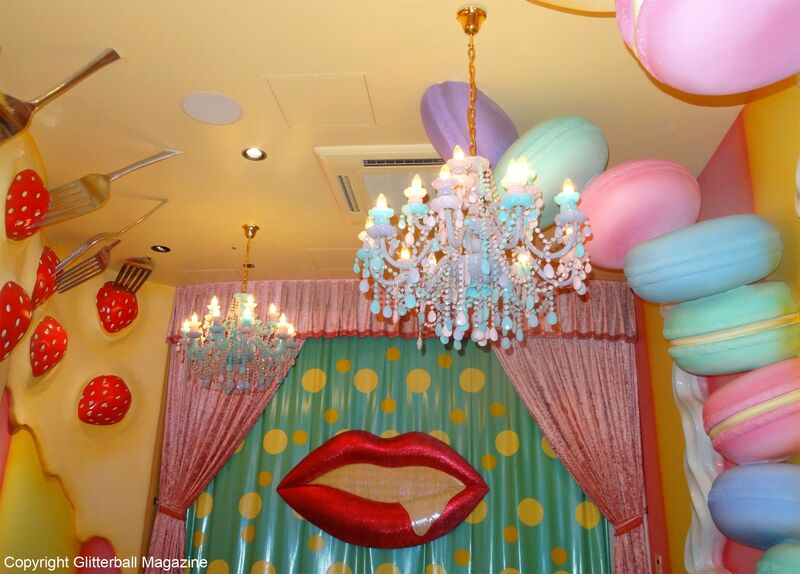 In the pastel coloured Mel-Tea Room, you’ll find an oversized lips display against a polka dot backdrop, giant strawberries and macaron stacks as well as teacup shaped booths. There’s also a wall shaped like giant chocolate bars. 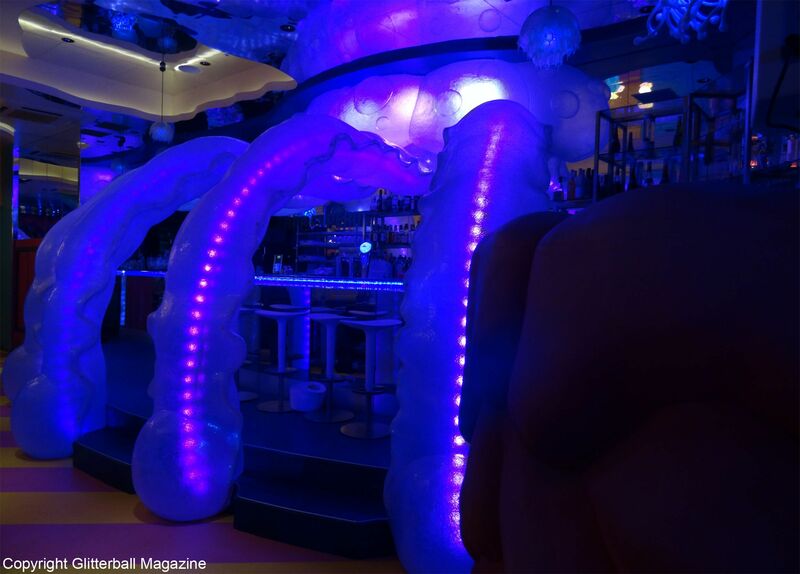 The Bar Experiment is the ideal spot to enjoy a cocktail by the bar and is surrounded by neon lights. 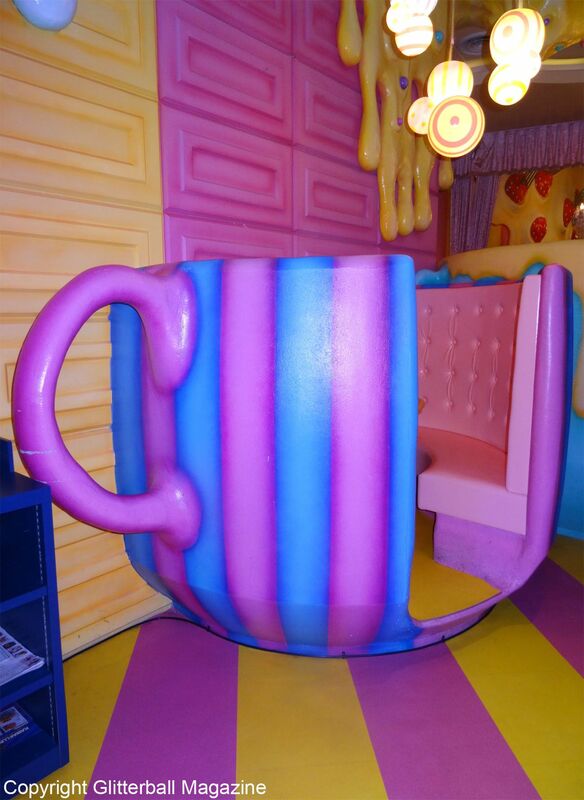 Walking through the Milk Stand room is like being inside the mind of Tim Burton and Melanie Martinez with gigantic animal heads and milk bottles. 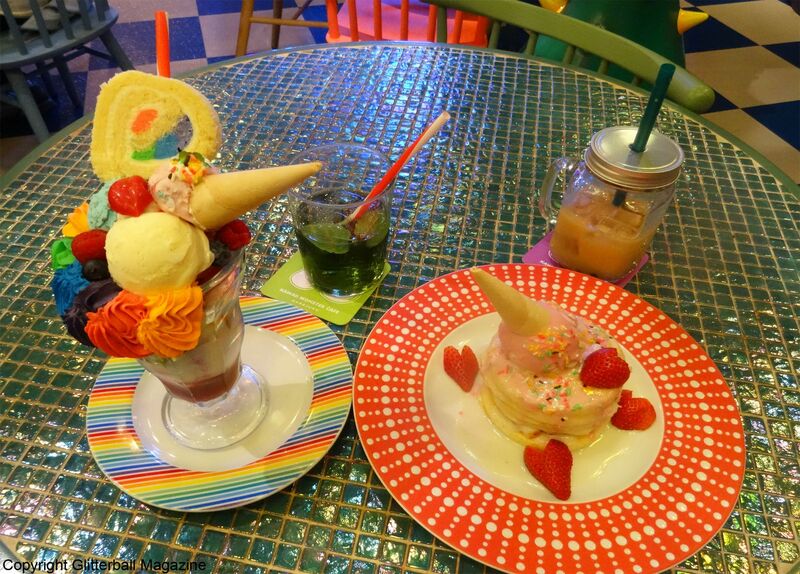 The weekend menu offers an exciting selection of kawaii inspired food like the Melty Pancake (Pink Sweethearts) costing 1500 yen (approximately £10.40) and Colourful Rainbow Pasta for 1300 yen (approximately £9.01). 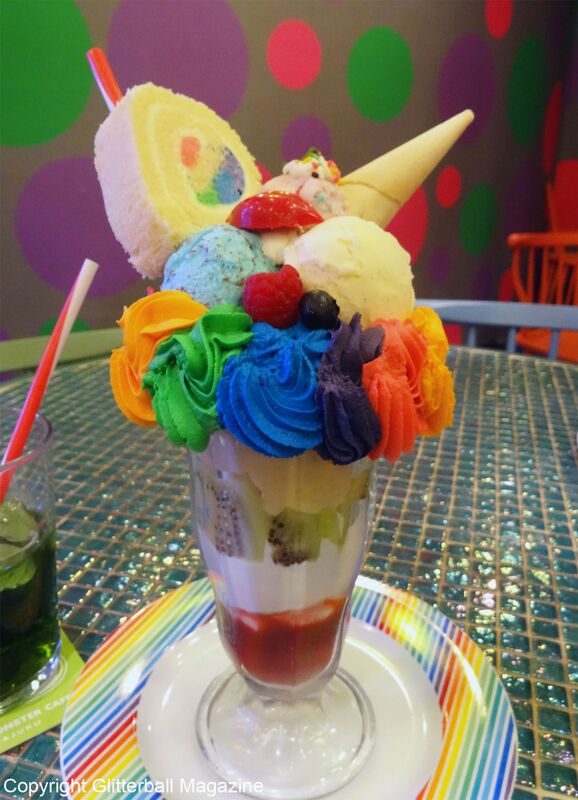 With eyes bigger than my stomach, I chose the Colourful Poison Parfait (Extream!) 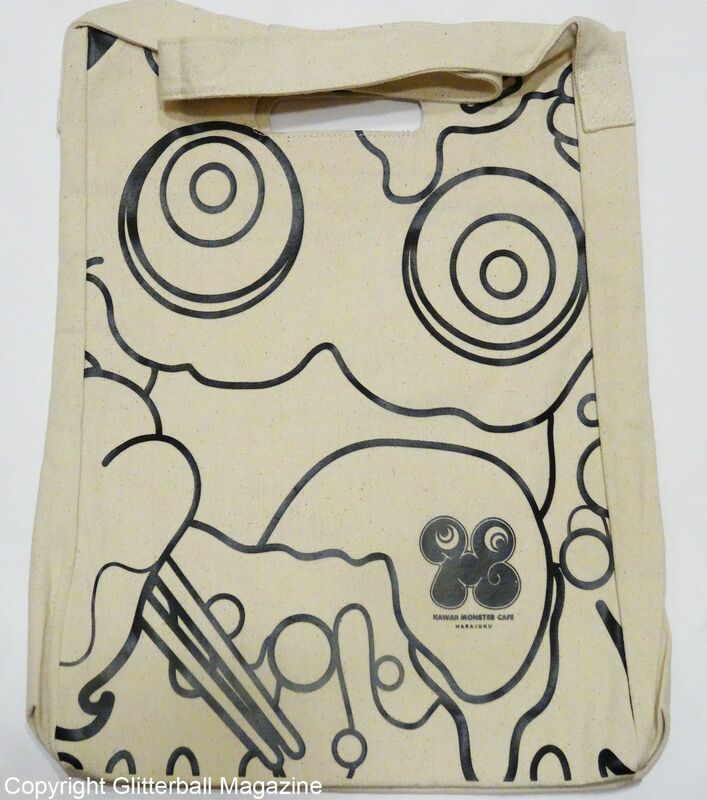 costing 2300 yen (approximately £15.94). 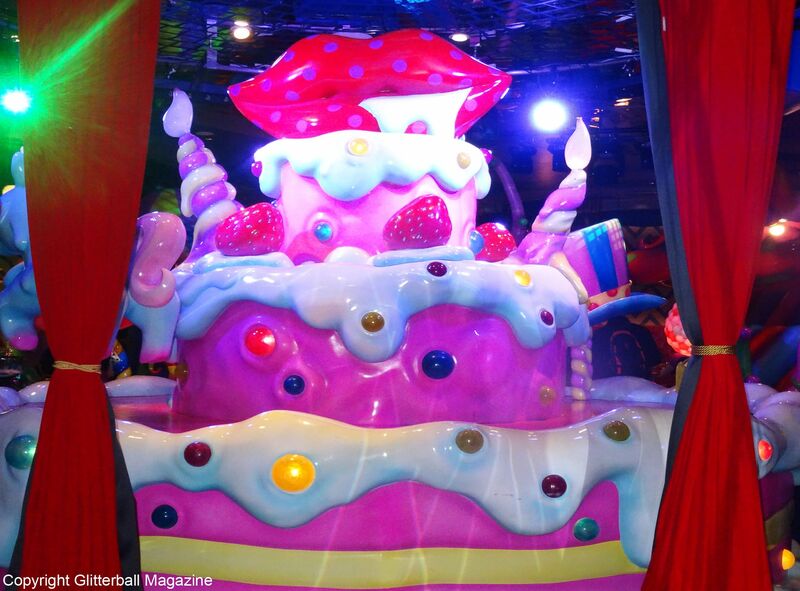 FYI: it’s perfectly acceptable to eat a mahoosive dessert in the middle of the day. With layers of rainbow coloured buttercream, ice cream and a Swiss roll, I couldn’t wait to tuck in. This enticing dessert also included fruit, so I could get a few of my five a day while gorging on this calorific treat. It tasted incredible. Ignoring the fact that my numerous food intolerances meant I should have avoided this delicacy, I was in heaven. It was sweet, fruity and filling. You know that bit in Matilda when Bruce needed to finish the entire chocolate fudge cake? That was totally me trying to finish this (I did!). Luckily, I was able to walk it off afterwards strolling through the streets of Harajuku looking for Japanese platform shoes. 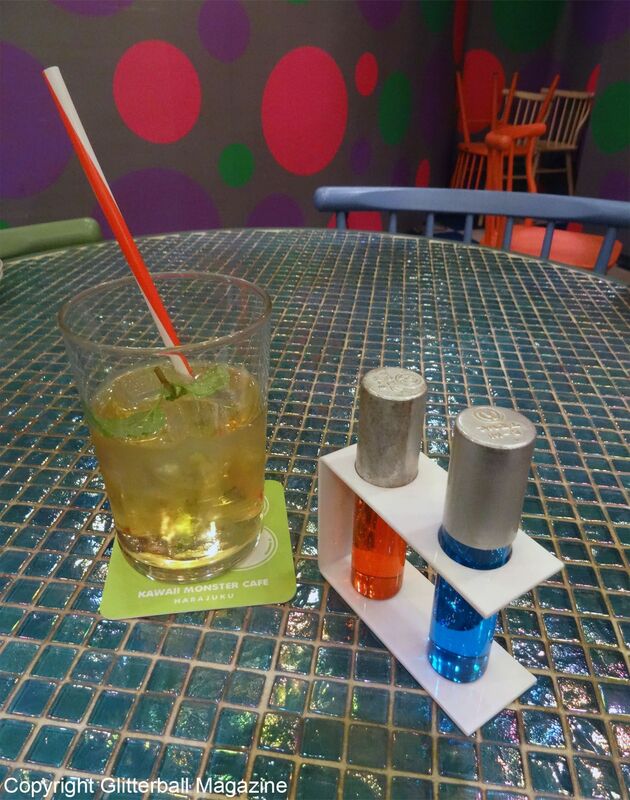 I opted for the interestingly named Druggy Cocktail (Experiment), which consisted of two colourful tubes I had to add to my drink. 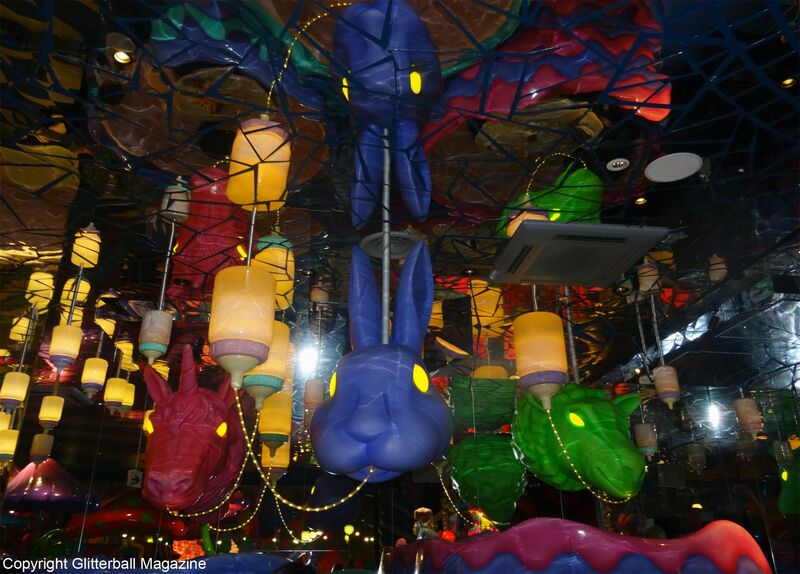 Once you drink a cocktail in Kawaii Monster Café, other cocktails seem so boring. 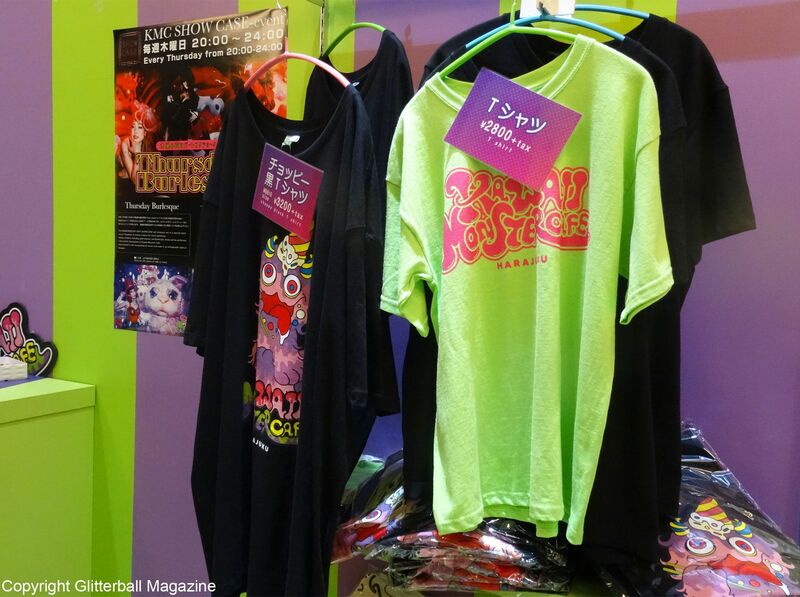 They’re reasonably priced too, costing 800 yen (approximately £5.50). 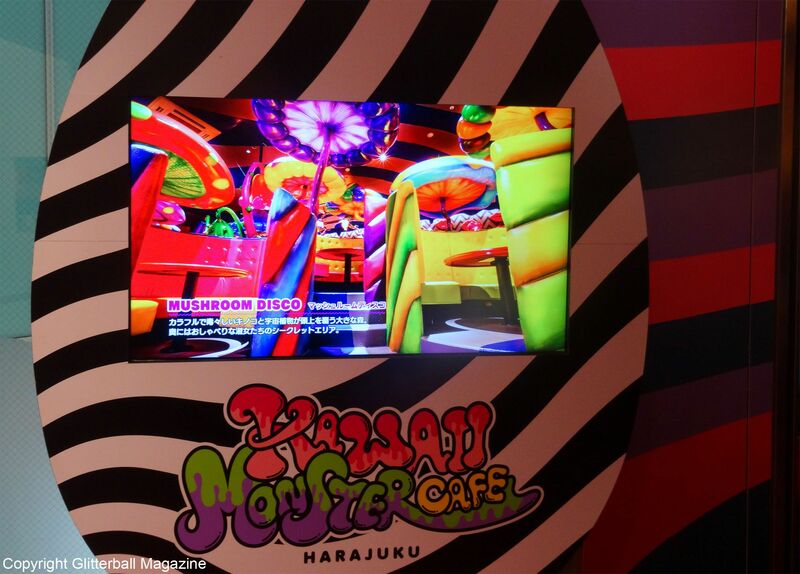 Japanese techno music fills the café throughout everyone’s dining experience, with a performance every hour. 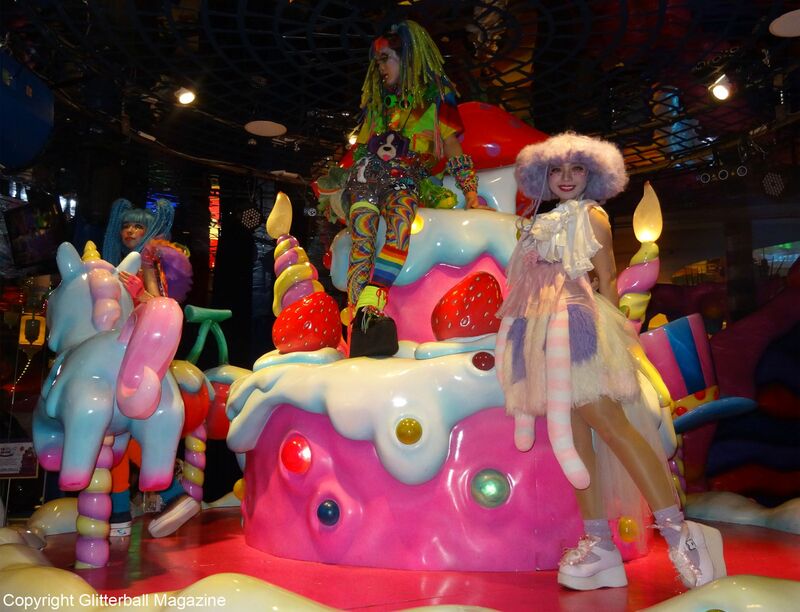 Taking place around the oversized merry-go-round, which features a giant cake, kawaii fruit, a unicorn and a bunny rabbit, staff dressed head to toe in neon, pastel, UV clothing and platform shoes pose and dance. If there’s a special occasion like a child’s birthday (which happened when I was there), they invite the children to join them on stage and pose for photographs. The only downside was not understanding what they were saying (the woes of a language barrier) but it was still fun to watch. 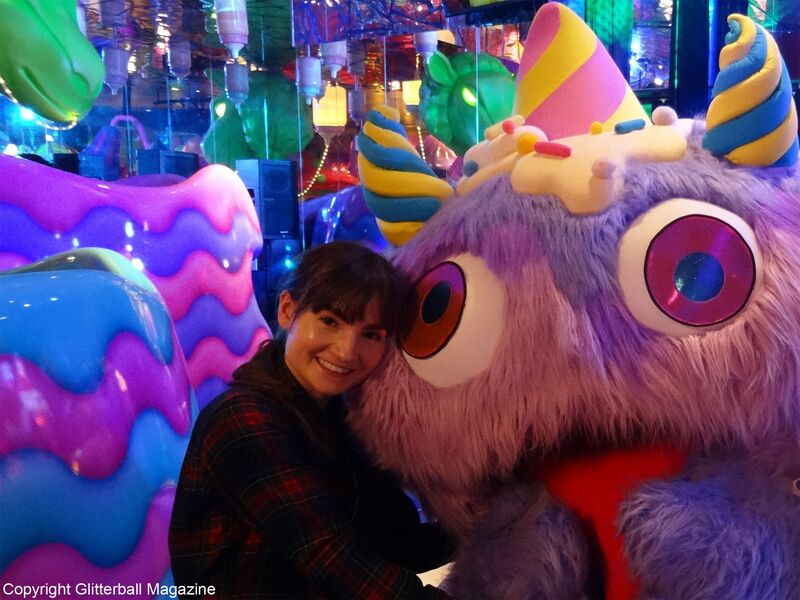 The main star of Kawaii Monster Café, the Chopstick Monster also made an appearance and ran around posing for photographs. Obviously, I needed to have a photograph taken. The café isn’t age exclusive, you know! I had a very heavy heart when I left. I really miss it! 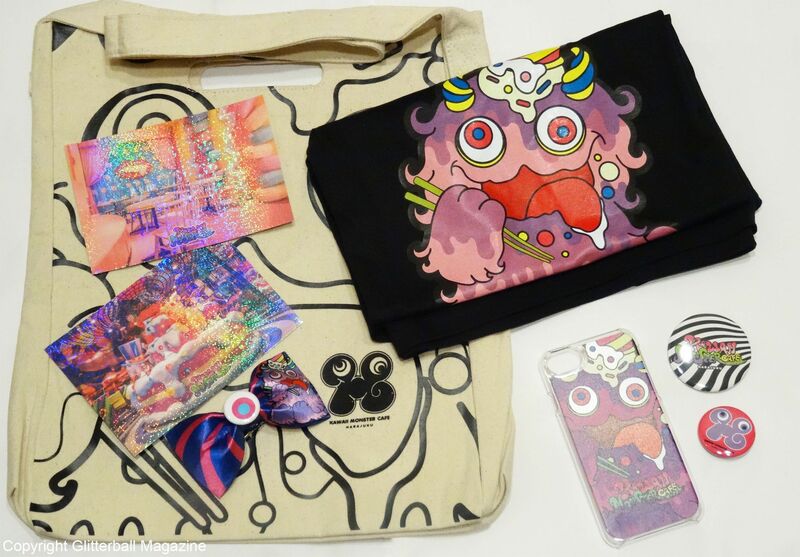 Check out my Kyary Pamyu Pamyu haul from Japan and find out more about the country’s most popular Harajuku star.